This is the first installment of a two-part series on ISO 55000, IIoT and EAM. After human assets, physical assets are a company’s most important resource. They have a huge impact on service delivery, business objectives, and the bottom line -- manage them poorly and the whole business suffers, manage them well and they become a cornerstone of value creation. Yet many organizations take their physical assets for granted, they are content to simply maintain their assets instead of leveraging their capacity to deliver business value. This represents not just lost potential but poor stewardship of stakeholder interests. Effective and efficient asset management can transform a business. For instance, by improving asset management, a major oil and gas company increased equipment availability by 3 percent and saved millions of dollars on insurance premiums. A food manufacturing company saw maintenance costs go down by 15 percent. A water services business, one of the largest utilities in the U.S., was able to improve service quality while reducing costs and risks. To achieve this kind of value creation, you have to understand that asset management is a puzzle with multiple pieces. You need all the pieces, and you have to put them together in the right way. Three major pieces are required to manage physical assets successfully: the industrial internet of things (IIoT), enterprise asset management (EAM) technology, and a “management system” approach, such as the one offered through ISO 55000. IIoT and EAM technology deliver the information and boost efficiency, while an ISO 55000 management system provides the foundation of business goals, processes, and structure that are needed to run the operation and create value. When most people hear “ISO 55000,” they don’t think “value”—they think “hassle” and “regulatory red tape.” But you don’t have to become ISO 55000 certified to benefit from a management system approach. ISO 55000 simply represents a best-practice for managing physical assets in a way that maximizes business value. By understanding the ISO 55000 approach and implementing it, you can align your organization with internationally-recognized best practices and increase the efficiency and effectiveness of your asset management operation. No certification required! ISO 55000 is the international standard for good practice in physical asset management. It describes what an organization must do to maximize the value of its physical assets on a sustainable basis. Like other ISO standards, ISO 55000 approaches the subject from a “management system” perspective. A management system is not software. It’s a manual of policies, processes, and procedures that an organization uses to run business operations in accordance with best practices and the organization’s desired outcomes. Common examples include occupational health and safety management systems (OHSMS), ISO 14001 environmental management systems (EMS), and ISO 9001 quality management systems (QMS). Like these, an ISO 55000 asset management system defines corporate policy, business goals, organizational structure, business processes, data standards, and performance measures. It provides the documented and strategic approach that is needed to effectively manage a large portfolio of physical assets. An ISO 55000 asset management system is a holistic program for directing and controlling all aspects of physical asset management. It unites organizational goals and structure with process, data, technology, and auditing tools to create an effective operation. It brings together the whole enterprise. 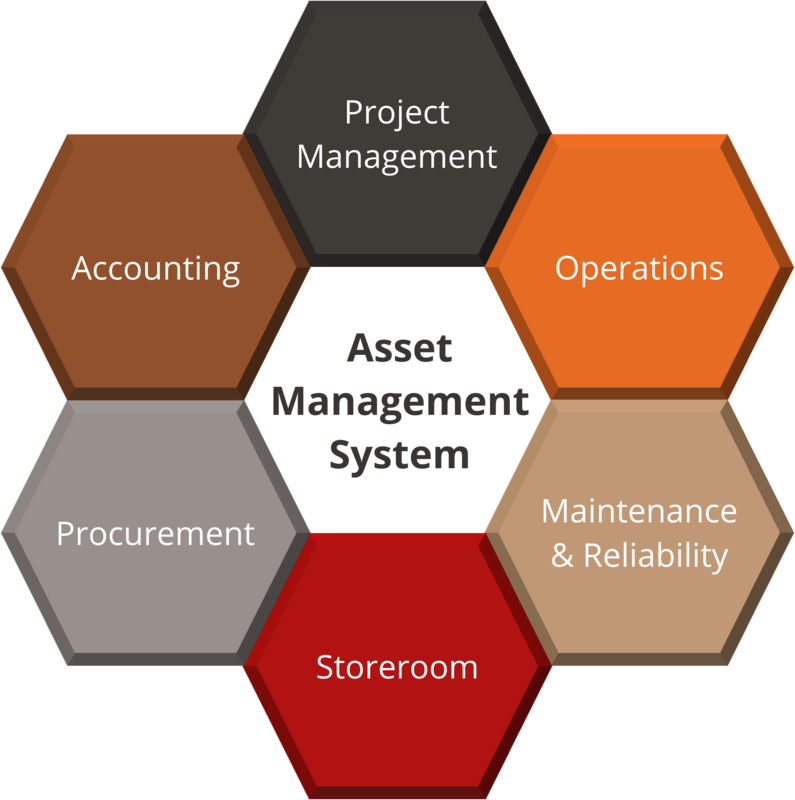 An ISO 55000 asset management system spans multiple business functions, including maintenance, operations, storerooms, procurement, and accounting. It lays out clear responsibilities, procedures, and goals for the whole operation. By doing so, it breaks down silos and gets the whole organization working together to accomplish asset management objectives. An ISO 55000 asset management system brings an organization together to achieve its goals. It encompasses the whole asset life cycle. 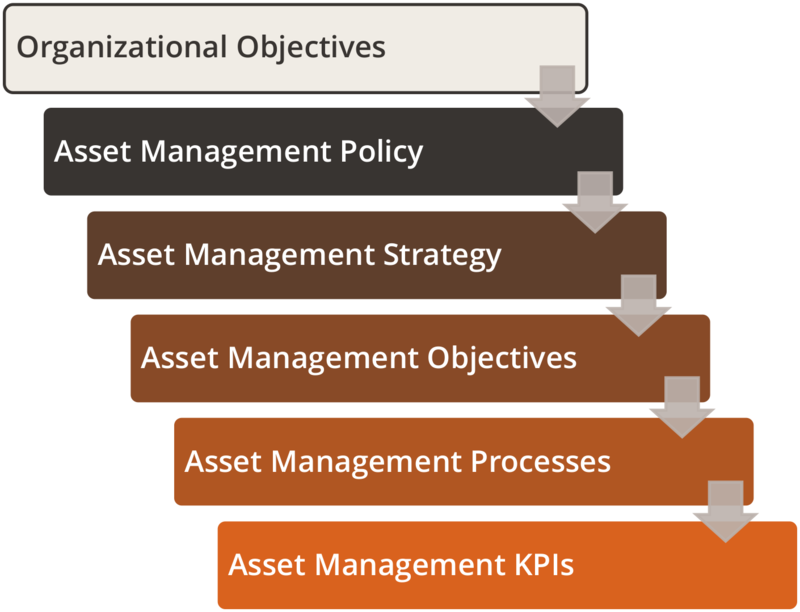 An ISO 55000 asset management system governs the whole life cycle of physical assets—from planning and acquisition to decommission and disposal. Because of this long-term approach, an ISO 55000 asset management system is an exceptional tool for reducing total cost of ownership (TOC) and increasing the overall return on assets (ROA). It aligns the whole operation from exec to tech. An ISO 55000 asset management system establishes an executive mandate for how the organization’s assets will be managed. It then works out exactly what this mandate means in terms of specific objectives, processes, and performance measures. This top-down approach makes asset management a team player in helping the organization deliver on its business goals. Establishes an asset management program that is aligned with globally accepted best practices. Coordinates maintenance, operations, and MRO supply chain activities to maximize effectiveness and efficiency. Improves risk management, energy management, HSE performance, and corporate governance—while leaving a clear audit trail. Optimizes return on investment for physical assets, capital projects, and asset management technologies (IIoT, EAM, CMMS, etc.). Enables EAM, CMMS, and ERP software systems to deliver thorough and reliable information. Speeds up improvements in the short term while laying a solid foundation for sustainable success. In one word, ISO 55000 is all about process. Process is the foundation of asset management. But process can’t act alone while being efficient at the same time. It needs technology partners—partners that help to streamline activities and improve information delivery. Those partners are IIoT and EAM. Check back in two weeks for the second part of "ISO 55000, IIoT, and EAM: Putting Together the Puzzle." I agree with the benefit of ISO 55000 as a Reliability professional, however I don't see customers demanding ISO 55000 certification like they did ISO 9000 etc back 20 yrs ago. Why because they expect products to be available when they want it at low cost. You would think that businesses would promote ISO 55000 to help them manager their assets, but I don't see any CEO caring about this. So how can we change this business strategy and get everyone interested? If CEO's don't have a Reliability Strategy and part of their Hoshin Plannning how will ISO 55000 ever be a tactical strategy? Food for thought.